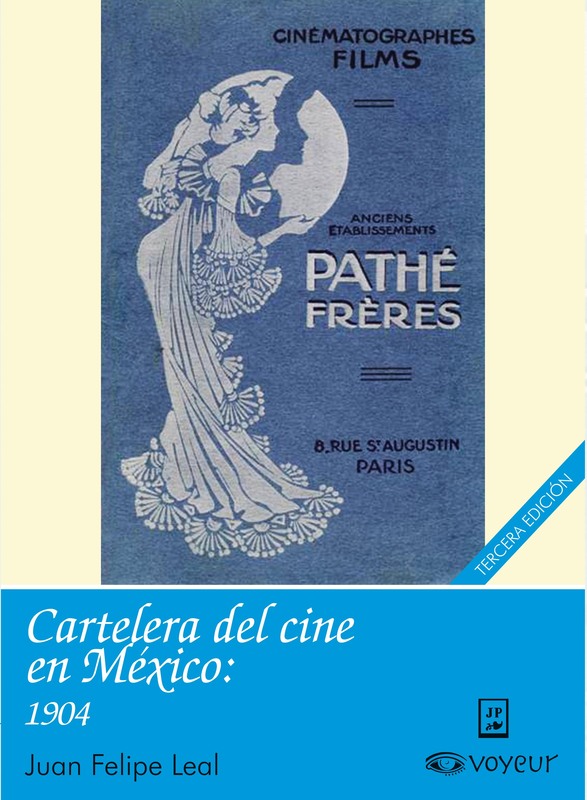 Tomado del International Review of Educational Cinematography, publicación mensual de The International Educational Cinematographic Institute, perteneciente a la Liga de las Naciones, abril 1930, año II, No. 6, páginas 684-700. Durante la breve historia que tuvo La Liga de la Naciones, antecedente de la Organización de las Naciones Unidas, se instauró el Instituto Internacional de Educación Cinematográfica, que a su vez edito la Revista Internacional de Educación Cinematográfica. Como parte del consejo editorial de dicha revista estuvo la escritora chilena Lucila Godoy de Alcayaga, conocida mundialmente como Gabriela Mistral. Que yo sepa este es el único intento que hizo por acercarce al cine. El siguiente guión, basado en el cuento de Charles Perrault, es una adaptación de la narración, pero con cambios sustanciales a la obra original. Estos cambios están explicados al inicio. Fue publicado en inglés en la revista y así lo transcribo. El guión consiste en cuatro partes y una introducción o nota. 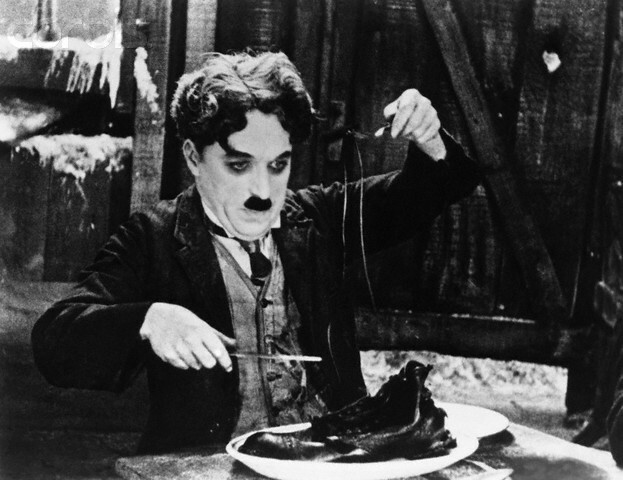 Resulta muy interesante constatar que la escritora tenía una idea muy bien aterrizada sobre lo que debía mostrarse en las imágenes y del lenguaje cinematográfico. 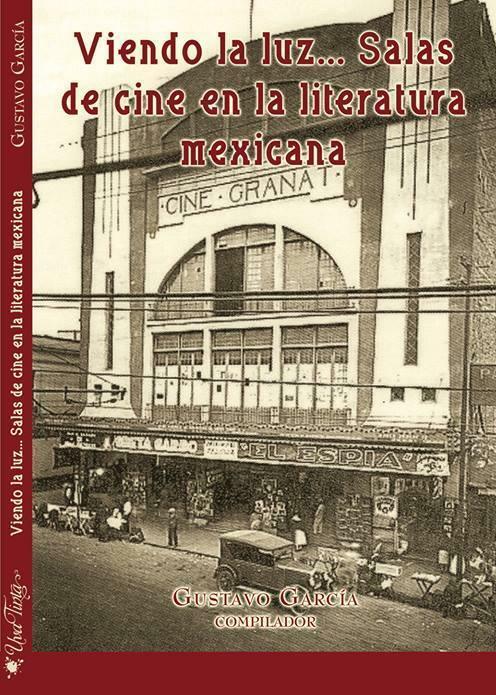 Recordemos que el cine parlante estaba en pañales y su visión del cine viene del periodo mudo. 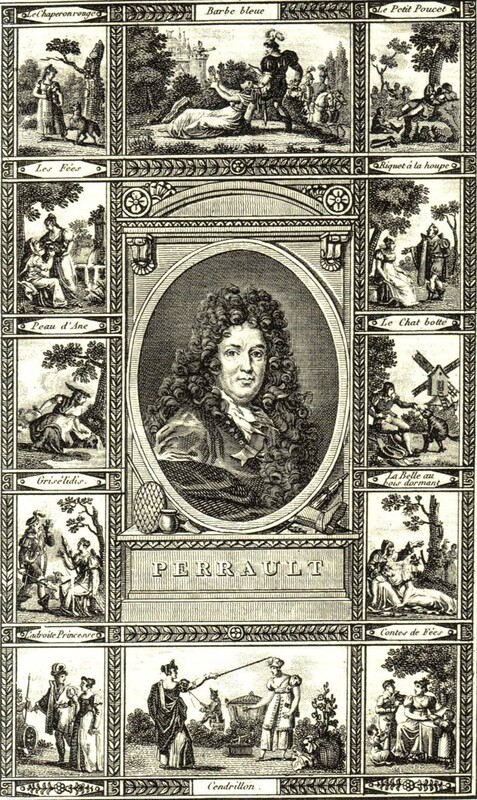 The original version of Perrault’s fable occupies only five pages. In order to adapt it to the cinematograph, it has been necessary to introduce some new scene, into it, and even entire parts, since the shortest cinema play is wont to last one hours I have, however, respected the precious folklore fable, and kept as far as possible to its essential lines. In this version I have attempted a number of things with greater or lesser success. The number of fairies specified in the banquet scene is seven. Since each of these has to express her wish, it would have been, necessary to repeat seven times over the same scene— a process which would be monotonous on the screen. But the picture would have been lacking in animation if a lesser number of fairies had been present. In order to avoid this difficulty in the scenario, I have made the fairies appear in groups of three; each group acts as a single person and express the fairy’s wish. Certain Christian symbols and phrases that do not appear in Perrault’s original have been introduced into this version. Infantile and popular fancy are so deeply impregnated with Christianity, that the images and phrases introduced will appear quite natural. I have also endeavored to simplify the story by suppressing one character in the second part: the old woman who is unaware of the order throughout the kingdom against spinning and continues to spin in her secluded nook. It seemed more plausible to make the bad fairy play the cruel part of deceiving the Princess and let her carry out herself the prophecy that she should be pricked by the spindle. There is a hiatus in Perrault’s fable – between the scene of the baptismal banquet and the Princess’s slumber. I have sought to fill in this long gap by introducing the pictures illustrating the Princess’s upbringing. Perrault’s fable does not suggest any effort on the part of the parents or courtiers to prevent the fulfillment of the doom. This is in fact the triumph of the fatalistic views of the ancient world. In the third part of this version I have introduced certain scenes at variance with this classic view of destiny: the Princesses make a determined but vain effort to overcome the doom. In, the pictures inspired by the legend and in its several versions, it is taken for granted that the palace and all its denizens fell asleep. It does not seem out of place to include the parents of the Princess among the victims of the doom. The division of the story into pictures does not follow any rigorous cinematographic order, but merely a coordination of ideas necessary for logical grouping. All minute details of architecture, costume, etc. have been left out, assuming that scene directors and producers are those best fitted and best able to reconstruct the scenes proper to the period. A typical eastern palace: either after the style of the Kremlin, or else resembling some Hindu temple or of Maya architecture. A monumental stairway in the center of the facade starts from a mound in front of the palace. On either side of the palace and behind it a great fir-wood stretches to the horizon. The palace is adorned with banners and surrounded by triumphal arches, as though for some great fête. An oriental crowd of rich and poor slowly take up their position on the rise in front of the palace. As in the pictures of the Magi and shepherds of Bethlehem, persons of all stations are arriving, some on foot, others on heavy cars, elephants, and dromedaries, bearing gifts sent by the governors of the Kingdom and by friendly Asiatic potentates. The humbler donors ride up on mules and asses and bring doves and birds and baskets of fruit. When the procession of gift-bearers has passed on, the crowd moves forward to occupy the best positions near to the stairway, down which the heralds are expected to come; the air is full of eager expectancy. Three of the King’s Heralds, preceded by trumpeters, slowly descend the monumental stairway; they halt midway, and announce, in the King’s name, the happy birth of an infant girl « as lovely as the Shulamite, as strong as Judith, and as welcome as the Angel of the Annunciation ». The crowd is thrilled with joy; the people raise on high their gifts and wave scarfs and multicolored streamers. The donors ascend the steps preceded by the heralds, raising on high their gifts: the crowd follows their movements eagerly till the last has disappeared — a poor boy carrying a little humming-bird, who plays with it as he goes up — they then disperse, leaving the mound at the foot of the stairway empty. The great inner courtyard of the palace. It is paved with lovely colored tiles like the rich Arabian courts. Ranged along the four sides of the quadrangle are brilliant colored birds in cages ; soldiers are seen changing the guard; some stand beside the columns, as rigid as marble, while others walk up and down the portico. The rich gifts brought are scattered all over the courtyard, which presents something of the confused aspect of a depot of war booty. The grand banqueting hall of the Palace decorated for a feast. The walls are lined with mirrors that multiply the palms and branches of almond-blossom that decorate the tables and hang in great festoons from the ceiling. So great is the profusion of plants and flowers that the hall suggests a beautiful garden. In a fine crystal cradle lies the little baptized infant, now a week old; she is a lovely oriental-looking baby with almond-shaped eyes. At either end of the board the King and Queen are seated, awaiting the arrival of the fairies. The table is laden with bowls of fruit — pine-apples, bananas, mangoes, etc. ; colossal cakes alternate with the bowls of fruit and with precious porcelain jugs full of wines and sherbets. Tripods full of burning incense diffuse their perfume from the four corners of the hall. The guards stand two by two by the doorways and the fairies enter in groups of three; they salute the King and Queen and then go over to admire the sleeping babe. The fairies appear as lovely youths and maidens. The former are all clothed in fern leaves, with a branch of myrtle at their waist; they are crowned with garlands of daisies and jasmine. Some are clothed like Greek dancers with bare legs and arms. Others are veiled. Others again are in symbolic costumes like those worn by the Sibyls; these are entitled to the places of honor at the board. All of them carry wands. After the entry of the fairies, sylphs, elves, and gnomes crowd on to the table; they turn summersaults amid the fruit bowls and the jugs of wine. The groups of fairies move in harmonious rhythm, as in the figures of a ballet. The group withdraws rhythmically and makes room for another. They make the ritual signs on the infant’s mouth and feet, and slowly withdraw. After each wish the royal parents bow to the group of fairies and thank them. As the fourth group of fairies is approaching, a loud knocking is heard at the door. The King asks his guests if any of the fairies are missing, but all shake their heads in denial. The knocks are repeated more loudly, but the guards don’t open. All stand listening in the hall. Suddenly the door is flung open and an old woman, worn in body and attired in rags, enters. In her attitude there is all the violence of the Pythonesses and the Eumenides. For a moment all the fairies stand paralyzed with amazement while the newcomer advances and stands beside the cradle. While the groups of fairies draw back with the instinctive horror that black magic always inspires, the King and Queen hasten across the hall and stand beside the cradle to protect their infant from the ominous intruder. The old Fairy stands out grimly between the royal couple. She looks formidably old, as though she had spent long years imprisoned in a tower. Her hair has grown stiff and wild like evil weeds in a field and form a grim aureole around her face; her mouth is convulsed as though uttering a curse. Her gown, unchanged for many years, is dropping in rags from her body; instead of the golden wand, shining like a sun-beam in the hands of the young fairies, she clenches in her fist an iron bar that she has wrenched from her prison window. « The Princess shall obtain all that the fairies have wished her, but she shall perish on her twentieth birthday, pricked by a spindle ». Horror of the royal couple and the group of fairies, who threaten the spoil joy, raise aloft their golden wands to avert the curse. The bad fairy makes cabalistic sign in the air: her fierce countenance seems to summon up all the powers of darkness. A thick fog envelops the hall, descending slowly on the board, the cradle, and all the groups of fairies. The King’s messengers are seen riding forth in all directions, even into the remotest villages, to summon the people to the public squares, where a royal decree is to be read out, forbidding anyone to spin in any part of the country and ordering the spinners to destroy spinning-wheels and spindles. A succession of oriental towns and villages are shown in which the royal decree is being read out. Crowds of people; women in hot dispute. When the messengers read out the edict, the people understand its purport, and disperse to obey and destroy the forbidden objects. The crowd returns bringing spinning-wheels and spindles. Pyramids of the condemned stuff are built up. The King’s messengers set fire to them in the presence of the people, who wish long life to the Princess. A large cave full of visible marvels and yet more full of invisible wonders. Enormous musk-plants drop living green stalactites. Gigantic ferns spring from the earth and intertwine their fronds with the musk. Unopened ferns take on the semblance of mysterious phantoms rising from the ground. Fungi of all forms and color, of startling aspect: some look like umbrellas; others like lamps; some like giant corals with fleshy chalices. Here and there an isolated rock looks like a living being. In the background, phosphorescent water-falls light up the whole grotto. The little Princess is seated in a clear space in the center. She is four years old by now, and gathers the fungi in her hands, gazing in wonder at their strange shapes. All of a sudden she is startled by a sound from the outside. A procession of sylphs, gnomes, elves, and imps enter the grotto by the main entrance, like school children flocking to a feast; some tumble from the roof with the agility of acrobats; through the side openings of the cave others wriggle in with serpentine movements. (« These « spirits of nature » can be acted best by marionettes, ably handled as in the « Teatro dei Piccoli »). The sprites touch the ground which they find hard, and go off to gather wild herbs and grasses from the woods to soften it. They pick up the little girl in their arms and seat her on the rustic throne, play with her tresses, pat her cheeks, and rock her as though to make her sleep. 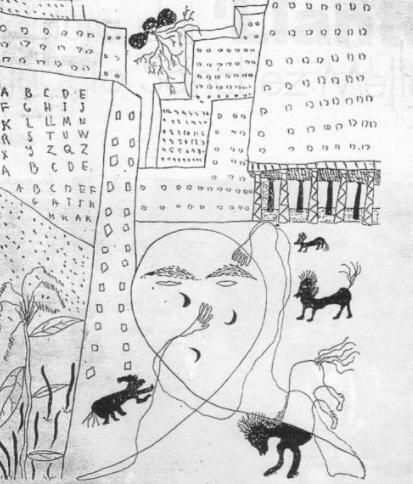 When they have set the child down, the « spirits of nature » dance wildly around her. The child points out to them the musk that hang down above her head, which she is unable to gather. The child turns towards the depths of the grotto, and gazes smiling at the phosphorescent waterfalls; she asks « Natures’ sprites » to pick her a little of the « burning water »”… The elves gather a fungus in the shape of a goblet, fill it from the cascade, and bring it to the little Princess. The evil fairy spies in through a crack amid the rocks to watch the princess playing with the elves. The great park of the Royal Palace. Tall isolated trees — araucarea, fir trees, and ilexes. An avenue of palm trees opens in the background, traces a perfect line, and ends in a circular lawn of exquisite texture, shaded by palm trees. Royal peacocks are perched on branches of the trees, and pheasants fly from one spot to another. From time to time gazelles and young deer run across the lawn, rapid as arrows in flight, enter the woods and disappear. The Princess is ten years old by now and is playing on the lawn with other children of her own age. Her white tunic, of the simplest cut, distinguishes her from her little play-mates. The group forms a circle; the Princess is placed in the middle and the others dance round her. The Princess, waves her arms gracefully to direct the dance; of a sudden she pauses to watch above her head the ring of another dance, invisible to all but herself, performed by « Nature’s spirits » with much greater elan than the daughters of man can attain. A royal procession advances majestically along the palm avenue: the King, the Queen, their chamberlains, ladies, and pages. Upon reaching the circular lawn, the procession pauses to watch the girls at play. The King turns smiling to the Queen. The children continue to dance their merry round. 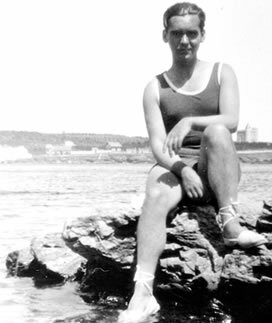 The gay spectacle suddenly brings back the terrible threat to the minds of the royal parents: as in a vision they behold above their heads the body of the girl at twenty, dead or alive, lying on a bier. . The parents’ eyes grow dim and the Queen’s head sinks on her breast. Night time. The sumptuous music and dance hall of the royal palace. Mandolins, psalters, violins, and harps are arranged in the corners on stools. An old dancing master stands beside a harpist explaining the steps. Four ladies of honor — dancing mistresses — teach the steps, the courtseys, and all the movements that must be carried out round the Princess. The Princess listens to the explanations and repeats them with the greatest exactitude. The Princess is about to complete twenty years and is seen in all her eastern beauty, soberly dressed, with a brilliant scarf that falls from her shoulders to her feet which she gathers up or allows to fall as the various figures of the dance require. She smiles sweetly whenever the dancing mistresses address her, and follows the various figures faultlessly, but with the slight air of shyness that all pupils have in the presence of their teachers. Invisible to the ladies, but not invisible to the Princess who is aware of their advent, the fairy god-mothers appear one by one, detaching themselves from the walls, like mists materializing into human bodies ; they also start to dance without advancing into the center of the room. The Princess almost ceases to pay heed to her mistresses. The magic spirit of the dance that belongs to fairies alone takes possession of her body. The Princess performs a new dance, miraculously inspired, that nobody has ever taught her, without paying any heed to the sounds of the harp; she sings as in a state of extasis. The dancing mistresses gaze at her first in surprise, and then, carried away by the beauty of her dance, they urge her on with cries of admiration. The musical instruments ranged in the corners of the room start playing by magic and diffuse throughout the whole ball-room waves of harmony that intertwine and form a sort of musical aura similar to that which musical geniuses alone can produce and no human heart resists. The dancing mistresses and musicians withdraw from the center of the room, leaving a vacant space for the Princess to dance in. A monumental clock chimes the hours of the night. A lady of honor approaches the dancer and begs her to stop so as not to exhaust herself, reminding her that on the following day she will complete twenty years and will have to take part all night in the festivities in the royal palace. On hearing these words the ladies of honor recall the threat that was then pronounced, and they almost see the body of the Princess, motionless and rigid, lying on the shawl that envelops it. The Princess, directing her steps towards her apartment, approaches the monumental stairway of the palace. She listens to a song she is unable to recognize, and turns her head from side to side in quest of the spot whence it issues; at last she perceives that it comes from the top of the palace, and she makes her way to a wide staircase that leads to the attics, which she mounts. A low attic in which the old fairy is spinning, accompanying her movements with a song. The young girl greets her merrily. The hag answers with a mocking curtsey. The Princess sits down on a rustic stool beside the spinner. The Fairy continues to spin with unmatched skill. The Princess follows the progress of her work with ever growing surprise. As the yarn lengthens, flowers and geometrical designs appear on it. It falls gradually from the wheel onto the Princess’s lap. The old woman looks at the Princess’s face and seeks a moment to catch her unawares and prick her with the spindle. The princess raises the yarn to the height of her eyes to gaze at its fine texture. The hag rapidly pricks her arm with the spindle. The Princess sinks to the ground and falls into a deep sleep. The hag rapidly flings aside her wheel and spindle and hurries down the stairs. The Bad Fairy arrives in the room underneath, which is the audience chamber. In the center stands a huge richly inlaid table; the walls are lined with tapestries; here and there rich Chinese vases adorn the apartment. The King and Queen are seated in front of one another; the King holds his pen as though writing; the Queen has a Persian cat on her knee. The royal couple fall asleep and the cat purrs on. The Bad Fairy casts a hasty glance at the scene and descends another flight. The guards’ hall: armor in the corners, two big deerhounds. The sentries as they stand are seized with the magic slumber and remain rigid as statues, with swords raised. Even the dogs drop asleep. The Fairy appears in front of the Royal Palace, rapidly runs down the staircase, follows the path to the neighboring wood, and disappears among the trees. Royal carriages drive up to the palace. Four young princesses, holding falcons on their wrists, alight and look aloft at the palace ; they have come from neighboring countries to make an effort to wake up the Sleeping Beauty, for the strange rumor of her fate has spread and all the sovereigns of Asia are moved to pity. They ascend the monumental stairway and walk noisily into the hall, talking and gesticulating. They mount to the attic, where the Princess is lying on the rough floor, close to the wheel and the spindle of her doom. The four princesses gaze at her in pity; they are moved, and call on her in the words of the eastern poets. Her face and body are still animated with life, but she does not move. The four Princesses appear at the head of the stairway bearing the fair sleeper on a sheet. They descend slowly and lay her down on the landing. Musicians and dancers of the people come up with bronze and copper instruments, their wrists and ankles adorned, with bracelets, rattle-snakes, and castanets. The Princesses give the signal for the music and dance to start. The players begin to beat their drums and play their cymbals. The eyes of the Princesses are glued on the fair sleeper; and, from time to time, they make impatient gestures for the music to go louder and quicker. The women dance wildly and click their castanets close to the ears of the lovely Sleeper. A dog appears at the edge of a towering pine wood. Bearing the body of the Fair Sleeper, still lying on the white sheet, the princess advances slowly, at a rhythmical pace. At a point in the wood where the grass grows soft as a down bed, they lay down the beloved body and stand round it waiting. A cavalcade of knights rides up on magnificently caparisoned horses. The cavalcade halts noisily near the Sleeping Beauty. The Princesses turn round their heads to see. The cavalcade is followed by a long file of heavy war wagons bearing soldiers and war material. The Princesses gaze at the Sleeping Beauty and veil their eyes with their shawls. The Sleeper sleeps on unperturbed. The Princesses turn sadly to gather up the four corners of the sheet and, skirting the wood, return towards the palace. A small clearing in the pine wood. The four Princesses enter it, carrying the Sleeping Beauty on her living bier, and take her to the back, where the waters form a series of cascades. They lay her down where the sound of the waters is loudest and still hang round their friend as though awaiting a miracle; but the Sleeper sleeps on. After a long pause, they gather up the corners of the sheet and carry the Princess from the wood. (D. G. Rossetti’s well-known painting « Dante’s Dream » might be taken as a model for this and the preceding pictures). More years have gone by. The Royal Palace still stands, but no sentries guard it and it seems entirely deserted. Weeds have overgrown the old lawn surrounded by the trees of the wood. Puss in Boots emerges from the wood: he carries a peasant’s wallet on his back and leans on a rustic stick. He gazes at the palace; remembers that a dread enchantment weighs on it, gives a loud and terrified miaow, and runs back into the wood, peering suspiciously around him. Little Red Riding Hood comes out of the wood, with her basket on her arm; she beholds the palace on which the hundred years’ enchantment lies so heavily, makes the sign of the Cross, and runs away. Aladin steps out from the forest with his wonderful lamp in one hand and in. the other a handful of phosphorescent stones. He recalls the story of the Sleeping Beauty. He halts, murmurs a prayer with lowered head, rouses himself, and returns into the wood. The Royal Palace is entirely hemmed in by a forest of pines and fir trees. From afar its towers, cupulas, and highest terraces alone can be seen. A group of hunters comes riding through a pathway in the wood. The sound of the horns and the barking of the hounds startle the deer and the pheasants, which are seen flying in all directions. The group of hunters rides up. They are dressed, in oriental hunting attire, but with a military note befitting the suite of a hereditary Prince. There is a brave show of horns and hawks; splendid hounds surround a cart on which the day’s bag of wild boars, deer, and birds are piled up. The Prince, in the center of the group, gazes at the horizon onto which the wood opens, perceives the palace hidden amid the trees, and asks the oldest member of his suite where they are. The old man narrates the story of the palace in which sovereigns and courtiers, servants, and all familiar creatures are asleep. He accompanies his story by gestures of horror. The Prince, on the contrary, is excited by the story, he rises eagerly in his saddle and points to the palace as a conqueror points to a city he means to take by assault. The other hunters surround the old man and spur on their camels to listen to the mysterious story of the palace and hear tell of the nightly visions which, according to the peasantry, appear on its towers, and of the vain efforts of the Princesses of Asia to arouse the Sleeping Beauty. The Prince continues to point to the palace, but no longer as though it was a prize to be conquered. 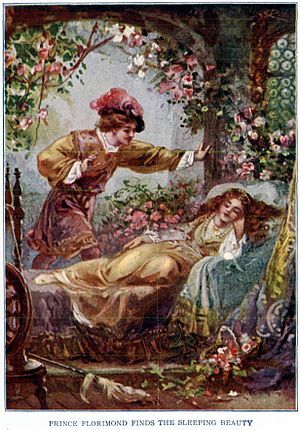 Hearing the tale of the Sleeping Beauty, sacrificed in the full blush of youth to the wicked enchantment, his heart has filled with a heroic feeling of pity. He is resolved to venture all to save her. Amid the acclamations of his suite, three knights offer to accompany the Prince, who spurs forward his horse, followed by his faithful bodyguard. The rest of the suite remains behind, feeling that the hunt has been spoilt, and turn wistful eyes on the slaughtered boars and deer. The horses leave the path they have so far followed and pick a way through the wood overgrown by weeds. The branches of the thick growth strike their faces; trunks that have been smitten by lightning impede the way. Ahead of them all, the Prince rides forward on his splendid horse, heedless of all obstacles. One of the horsemen, whose face has been cut by a passing branch, begs the Prince to turn back. The Prince in answer merely smiles contemptuously and signs to him to leave. A bog appears. The trunks of trees stand out from it. For it is a submerged tract of the wood; giant crocodiles sleep with the heavy sleep that has invaded the palace; hippopotami, half immersed in the mud, are likewise still and petrified. To the right and left of the bog the wood, with its dried and seer trees close against one another, forms a wall which the horsemen stare at in dismay, realizing that they cannot possibly get through it. The Prince talks with one of his two followers, discussing how they can get through the morass. The other loses heart, bows deeply, and takes himself off. The Prince spurs on his horse and enters the bog, followed by the last horseman of his suite who has stuck to him; they pass, immersed up to the waist, amid the sleeping beasts, and reach the opposite bank. The wood is veiled in unnatural darkness; from all sides confused forms appear, as of persons or clouds of mist that solidify around the horsemen and prevent their seeing; a will o’ the wisp advances and retreats along the road as though to mock the two adventurers. The third hunter addresses the Prince earnestly, pointing out the risks of the enchanted region into which they have entered: a demoniacal land in which only death can await them. Tears run down his terrified face as he recalls the Prince’s parents who are awaiting his return. As he is speaking other vague and errant forms pass between him and the Prince and terrify the horses, which rear and try to bolt. The Prince listens calmly, while he holds firmly on the reins and forces his horse to stay quiet. He seizes the axe from his companion’s belt and grips it with a firm hand. He kisses his friend on the brow and seeks to enhearten him; then plunges alone into the wood, now followed, now preceded or accompanied by the shapeless forms that would impede his path, which he drives off with lusty blows. The Prince has at last got through the savage forest and approaches the monumental stairway to the palace, bathed in the midday sun. Extending his arms towards the palace, he salutes the moment of his victory, thanking the God of heroes and his own strong heart. He then alights from his horse, and caresses it as the good friend of heroes, with his arms around its neck. The Prince takes in at a glance the facade of the palace; he airily ascends the great stairway, whose marble flags are intergrown with weeds, and bangs at the door that stands solid as a rock. He snatches the axe from his belt and deals blow after blow violently on the door, till it splinters and gives way. The Prince enters an ample vestibule and comes to a second door, which he demolishes with his hands alone. He ascends the inner staircase. 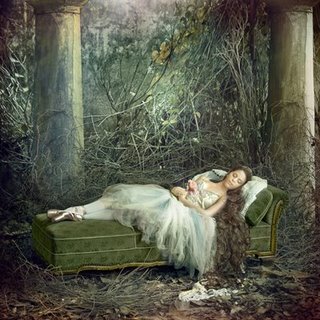 .. .and reaches a magnificent hall in which there stands only a couch, that upon which, long years ago, the Princesses composed the Sleeping Beauty for her long slumber. The lovely maiden lies asleep in the full beauty of her twenty summers. Her hair is unbound, the motionless folds of her tunic are composed around her, her hands crossed on her breast like a sleeping figure on a tomb, her shapely shadow is revealed on the wall as the Prince approaches her. The Prince stands beside the Sleeping Beauty; he makes the sign of the Cross above the maiden; then slowly bending down over her, he kisses her on the lips. The Sleeper’s eyelids flutter; her head moves; her tresses stir on the pillow; her hands fall apart, while a smile appears on her lips, as though from the mysterious depths of some dream. Slowly the Sleeping Beauty rises on her couch. Meanwhile the Prince’s hands are spread out over her. Seeing her move. . .
…he assists her to rise. Standing on her feet she turns a puzzled look on the man who has rescued her; attempts to take her first steps as though she were just learning to walk; then touches the bed, and the walls of the room, as though to convince herself of their reality. The Prince flings wide the windows. The sun — the foe of dreams — pours in in floods; the Princess gazes out at the forest and beholds the old familiar scenery as it was submerged in her memory a hundred years ago. The Prince and Princess descend to the floor below, where the Princess’s parents are sleeping. As they approach the royal couple they stir, at first rise languidly, and then run towards their daughter with great signs of joy. The royal couple and the Princes went their way downstairs and enter the other apartments where the guards are slumbering. They too awake, and, after a moment’s hesitation, come towards their liberators. The royal couple, the Princes and the guards pass into the room where the sewing maids of the palace are sleeping their enchanted sleep — some with their needles raised ; others cutting out cloth, others trying gowns on a lay-figure. They make the same movements of surprise and indecision, and evince the same joy at being liberated. The Royal couple, the Princess, the guards, and the maids penetrate into the colossal kitchen of the palace, where the chefs and cooks were overcome by sleep in the midst of their work: some skinning boars, others lighting the fires, others again preparing a magnificent cake. The same agitation, the same joy at being reawakened. The crowd of the royalties and courtiers and servants enters the great central courtyard of the palace — the courtyard of the natal gifts. As they appear, the sleeping birds wake up and begin to sing ; from all sides the animals of the palace come running and flying in — splendid dogs, deer-hounds, bull-dogs, cats, doves, and chickens, to the amusement of all present. In this scene of joy of men and beasts symbolic of all fables, the King blesses the princely couple, amid the acclamations of the people just awakened from their hundred years’ sleep. * Minificción tomada del blog Químicamente impuro.